Low-fat chocolate that actually tastes good? Thanks, science. We’re not talking about the dark variety either, the kind most often associated with health benefits. But instead, researchers from Temple University in Philadelphia have found a way to reduce milk chocolate’s fat content by 20 percent. Cocoa solids are one of the richest sources of antioxidant flavonoids, but unfortunately, most chocolate products are high in cocoa butter, oils, and other fatty ingredients. 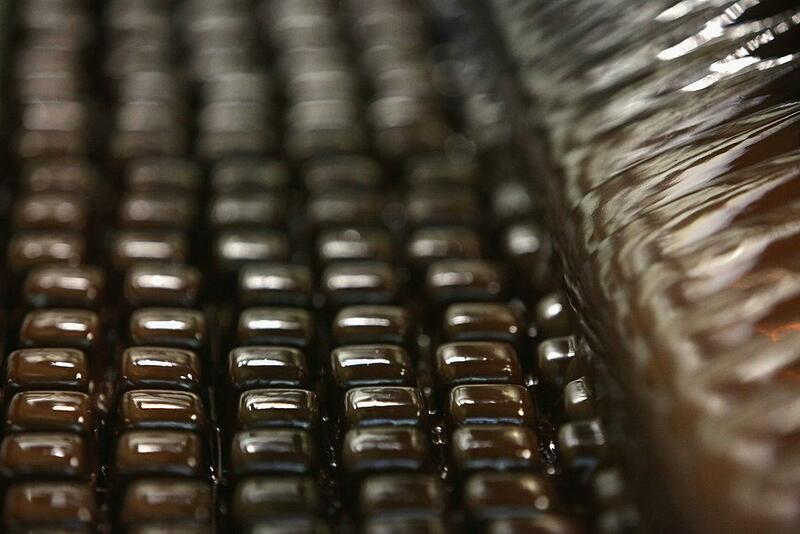 This is because when liquid chocolate flows through factory pipes, the step before it’s solidified and wrapped in foil, cocoa tends to pack together and get jammed — butter keeps everything moving. The researchers reported that fats make up to 40 percent of a typical molding, 25 to 30 percent of which are cocoa butter. The rest are other oils and fats. “Because children are the leading chocolate consumers, reducing the fat level in chocolate to make them healthier is important and urgent,” they wrote. So when a consulting firm working for Mars Inc. — the manufacturer responsible for M&Ms, Snickers, and Twix bars among others — contacted the Temple team for help, they agreed. According to NPR, the company got in touch with lead study author Rongjia Tao specifically because he specializes in electrorheology, a type of science that’s dedicated to a deep understanding of liquid suspensions. “Most people think of chocolate as solid because this is how they buy and eat it,” he and his team explained. “To the chocolate maker, however, chocolate is a liquid for the whole process of production and only solidified just before it is ready to be packed and sent to the warehouse or store." Tao’s team stepped away from traditional electrorheology to make their own device, a sort of electrified pipe, to better measure chocolate’s thickness. When researchers poured in the liquid chocolate, they could see the particles consisting of cocoa, sugar, and milk solids cluster in a line along the pipe as it flowed through. When they sent in electric shocks, the chocolate’s viscosity dropped. The thickness of liquid chocolate consisting of 60 percent cocoa solids and 40 percent melted fat was around 84 percent pre-electric shock — afterward it dropped down to about 15 percent.In this state, the researchers can reduce fat by 20.5 percent without it clogging factory pipes. Overall, the experiment went better than expected, researchers wrote. But scientists not involved with the study aren’t sold on the idea just yet. The public may soon be able to taste for themselves. Tao is reportedly working with “a major chocolate company” to get his electric chocolate into the hands of its loyal consumers very soon. Source: Tao R, et al. Electrorheology Leads to Healthier and Tastier Chocolate. Proceedings of the National Academy of Sciences. 2016.